North West Festival reveals more additions to the line up! As if the North West Festival in its first year wasn’t big enough already, Sunset Events are thrilled to be adding more names to the bill, bringing the Pilbara the hugest line up in history. Joining the already rock solid line up of Hilltop Hoods, The Living End and The Cat Empire are Regurgitator, Dead Letter Circus and San Cisco. Even with these fantastic bands being added to the bill, ticket prices will be remaining the same – even better value! These six amazing artists will be blasting into the Pilbara region, taking over the Port Hedland Turf Club on Saturday 18th August. 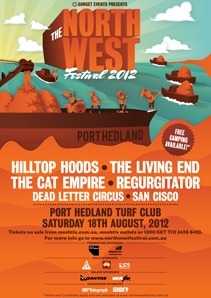 Tickets are on sale from moshtix.com.au, moshtix outlets, and selected North West outlets or by phoning 1300 GET TIX (438 849).